Charter a private flight to Bangkok, the capital and most populous city of Thailand best known for its vibrant street life and cultural and religious landmarks. Hiring a private jet into either (VTBS, BKK) Suvarnabhumi International or (VTBD, DMK) Don Mueang International is the best way to get in and out of Bangkok, and our team at Air Charter Advisors is here to offer the highest standards in executive and leisure travel. Air Charter Advisors offers on-demand private jet charter service to/from Bangkok, and with access to thousands of private aircraft around the world, we’re confident we can arrange the right aircraft for your trip, whether flying internationally or domestically within Thailand. Our private jet charter company is Wyvern-certified, and all of the aircraft we use for flights to Thailand are operated by FAR Part 135 (or foreign equivalent) air carriers. Our growing list of distinguished clients includes royal family members, heads of state and C-level executives from major corporations; celebrities, personal assistants and leisure travelers from around the world. Enjoy the peace of mind you get from working with a charter broker you can trust for your next Thailand-bound flight, and we’ll be your local and global aviation solution for luxury air travel, aircraft acquisition and private jet management. Call or request a quote for your charter flight to Bangkok, Thailand. Our team is here to help you with all of your private aviation needs, from booking your aircraft and creating its flight itinerary to arranging gourmet in-flight catering, luxury ground transportation or accommodating any other special requests – consider us your one-stop shop for all things private aviation in Bangkok. What started as a small trading port in the 15th century has grown to a population of over 8 million people, roughly equal to 12 percent of the country’s total. It’s roots can be traced to the Ayutthaya Kingdom when it was born along the west bank of the Chao Phraya River delta in Thailand’s central plains. The river meanders throughout the city and empties into the Gulf of Thailand, and the river served as the main form of transportation until late in the 19th-century. Bangkok’s development over the years has turned it into a portal of entry for western concepts and goods, many of which have been adopted by Thai culture to some degree. 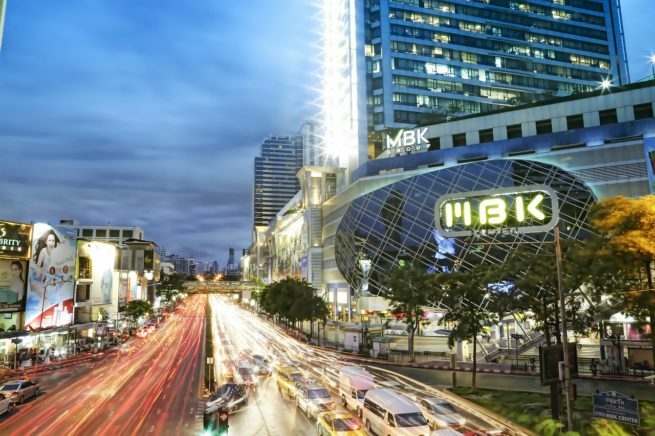 One of the biggest impacts Bangkok’s relationship with the western world has created is its position as an international trading hub, and as a result, changed a few aspects of life in Thailand. Technology has permeated its way into everyday life, and mobile phone and smart phones can be seen everywhere. This adaptation of western values has also led to a bit of secularism throughout the city, where religion’s role has seen itself somewhat diminished. You’ll notice that the locals subscribe to the school of “conspicuous consumption” as a display of economic and social status, and it’s common to find locals hanging out around shopping centers and malls. Despite the rising secularism brought on by Thailand’s modernization, an overwhelming majority of people here are Buddhist, accounting for 91 percent of the city’s population. Other prominent religions here are Islam, Christianity, Hinduism, Sikhism and Confucianism, although only the first two account for more than 2 percent. Bangkok is also home to a large Chinese community, while immigrants of Khmer, Northern Thai, Lao, Vietnamese, Tavoyan, Mon and Malay descent round out the population. 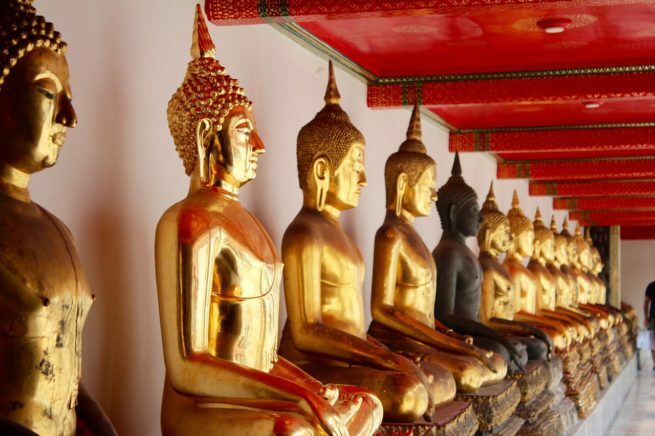 Bangkok’s multi-faceted sights, attractions and city life appeal to diverse groups of tourists, making it one of the world’s top tourist destinations and a popular destination for private jet charter flights. Ranked as the top global destination by international arrivals in MasterCard’s Global Destination Cities Index, the city welcomed nearly 16 million visitors in 2013, and it ranked as the 4th in tourist spending for the same year, trailing only New York, London and Paris. It was also named “World’s Best City” four years in a row by Travel + Leisure magazine. Royal palaces, temples and museums make up most of the major historical and cultural attractions, and a variety shopping and dining experiences offer a wide range of choices and prices. The historic Grand Palace and Buddhist temples such as Wat Arun and Wat Pho contrast with other tourist attractions such as the nightlife scenes of Khaosan Road and Patpong, but if it’s the nightlife you’re looking for, Bangkok won’t disappoint – it didn’t acquire the nickname “Sin City of Asia” on accident, you know. A lack of urban planning and regulation during Bangkok’s rapid expansion has resulted in a disorganized cityscape with inadequate infrastructure. The city created an extensive network of elevated expressways to help get traffic in and out of the city, but the overwhelming number of people, limited roadways and high rate of private car usage in the city create chronic and crippling traffic congestion. The National Highway and rail networks connect Bangkok to the rest of Thailand. Bangkok is one of Asia’s busiest air traffic centers, and it’s international airports each welcome around 40 million visitors annually. Because of the extreme air traffic going in/out, private charter flights are the best way to get there and back. Our Bangkok Air Charter team can arrange charter flights in as little as 4-6 hours, and our team is available 24 hours a day, 7 days a week to assist you with all your private aviation needs. Thanks to the Asian investment boom of the 80’s and 90’s, Bangkok is a regional force in finance and business in Southeast Asia. Bangkok is home to the headquarters of all of Thailand’s major commercial banks and financial institutions, as well as the country’s largest companies. The city’s rapid economic growth also resulted in several multinational corporations relocating their regional headquarters here thanks to lower workforce costs and its location relative to other major Asian business firms. Today, Bangkok is an international center for transport and health care, and it has emerged as a regional leader in the arts, fashion and entertainment. The city’s economy continues to grow, and it ranks as 6th in per-capita GDP among Asian cities following only Singapore, Hong Kong, Tokyo, Osaka–Kobe and Seoul. Executive and Business travelers looking to charter a private jet to Bangkok can benefit from the level of service we provide. Our company is Wyvern Certified, using the same safety standards and due diligence processes that meet or exceed the requirements several Fortune 500 companies apply to their own corporate fleets. We take your privacy, safety, and comfort very seriously, and our team diligently reviews the details of the latest Wyvern PASS reports for pilot safety, aircraft maintenance and operator history when arranging your private flight. Book your next private flight with us, you’ll know you have a partner you can work with for every flight you need in the future. If you have a private or corporate aircraft that has a mechanical issue, or you need to arrange simultaneous trips for your business executives, we can arrange a supplemental lift to Thailand in as little as 4 to 6 hours. Bangkok Jet Charter offers unlimited quotes with zero obligations – if you’re a fractional owner or a jet card member, give us a call before reserving flight hours and compare us to your current plan! Despite the city’s substantial income inequality, Bangkok offers some of the most extravagant and luxurious accommodations in Southeast Asia. Most of our private jet charter will be familiar with several of the five-star brands set-up in the city, most notably the Mandarin Oriental, regarded as one of the premier hotels in the city. The St. Regis, Shangri-La and InterContinental also offer luxurious five-star accommodations. Looking to enjoy a round of golf while in Thailand? Le Meridien Suvarnabhumi is set among a lush 18-hole golf course. No matter where you decide to stay, Air Charter Advisors can arrange for luxury ground transportation after your private charter flight arrives to bring you to the resort or destination of your choice. Request a Quote or give us a call at 1-888-987-5387 to speak with one of our Bangkok Private Jet Charter agents for your next luxury vacation, business trip, or special event.